Ed Milliband Conference Speech. Showing how it’s meant to be done! Congratulations Ed Milliband. The leader of Britain’s Labour Party just delivered what can only be called a barn-stormer of a speech. In the age of the bland and of the auto-cue, he just reminded us of what an old fashioned speech should look like, sound like, and feel like. 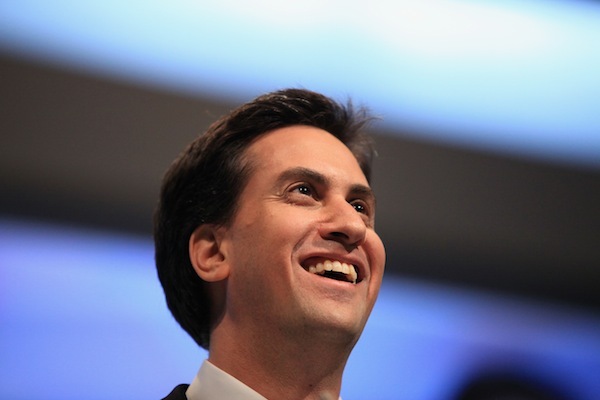 One speech does not an election win, but Ed Milliband has done himself a tremendous deal of personal good today. Had you asked me this morning if I thought David Cameron had anything to worry about in the next election, I wouldn’t have counted Ed Milliband as being amongst his troubles. This speech has just changed my mind. 1: It was all from memory! Not an auto-cue in sight. For over an hour, the speaker spoke from memory, and with zero trips or hesitations. An incredible achievement under the pressure of audience, spotlights, and TV cameras that allowed him to…. Everything was aimed directly at the audience. Without an auto cue to look at, notice how easily the speaker can move himself around the stage, and his gaze around the entire audience. There are slow bits, fast bits, quiet bits, crescendoing bits, sad bits, and there are even…. Normally a no-no. Jokes can be so very dangerous, but he pulled it off. How? By a perfect choice of subject matter guaranteed to get a conference giggle. From the word go, there were some wonderful allusions. My favourite was the oak tree reference in the first two minutes. A wonderful multi-level metaphor that set up the forthcoming…. You can never repeat a key message too many times, and even though some commentators are accusing Milliband of doing just that, with his 46 references to “one nation”, it’s interesting to note how his choice of trope is now broadbanding it’s way across every media outlet in the UK. By tomorrow morning there won’t be anyone within reach of a TV, radio, or newspaper who won’t have heard it! Last week I criticized Liberal Democrat leader Nick Clegg for being perched on his little podium, a slave to the TV cameras. This week we saw Ed Milliband using a large square podium, and even though there were people sitting behind him, just take a look at the way he walks that podium, in the “Square Dance” method we mentioned last week. A superb performance, and whether your passion is Public Speaking or Politics or maybe even both, do take a look at today’s speech on BBC.com.